This sterling silver Claddagh charm with Celtic knot-work is designed for a bead bracelet. This sterling silver Claddagh charm features filigree Celtic knots that extend up from the wrists and it is enhanced with a green crystal heart. The double sided charm measures 3/8” diameter x 1/4" thick and it is engraved with the words love, friendship, and loyalty. 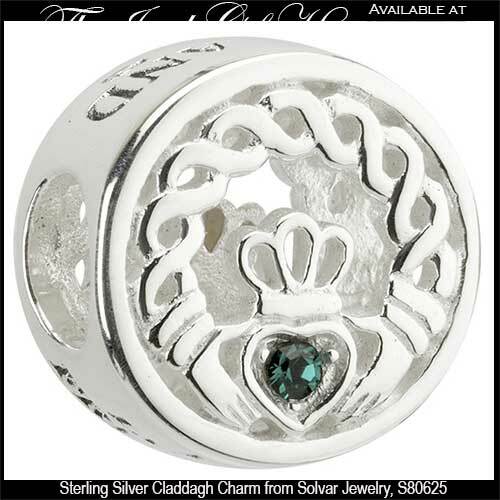 The sterling silver Claddagh bead will fit all competing charm bracelets and it is made by Solvar Jewelry in Dublin, Ireland. The charm is gift boxed with a Celtic knot and Claddagh history cards that are complements of The Irish Gift House.